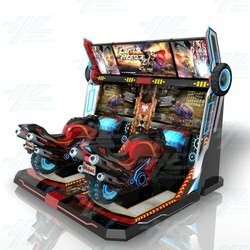 Crazy Motorcycle is a motorcycle racing arcade machine from Sealy. Riders take the role of a motorcycle riding enthusiast and challenge experts to race and overcome obstacles. Choose from 14 fashionable motorcycle bikes and 32 race scenes with challenging track designs for a new experience every time you race. The game also features a Networking Contest Mode. Crazy Motorcycle is a motorcycle racing arcade machine from Sealy. Riders take the role of a motorcycle riding enthusiast and challenge experts to race and overcome obstacles. Choose from 14 fashionable motorcycle bikes and 32 race scenes with challenging track designs for a new experience every time you race. The game also features a Networking Contest Mode.